If you need a car to go with your bell bottom jeans, paisley shirt, exposed chest and longish unkempt hair, this is it. It screams Quaaludes and disco from the top of the highest skyscraper while giving high fives to all kinds of random dudes. This next car dates from the "me" decade when you found cars in your local print newspaper and TiVo was this miserable thing called TV Guide that meant you had to plan to watch your favorite TV shows. 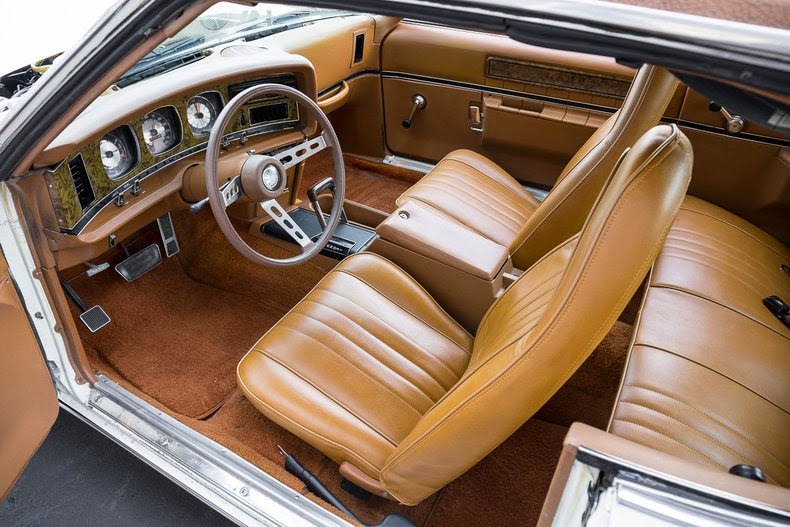 The 70s, well...we are mostly glad they are long behind us, but this car is an awesome melange of brown, gold and white. 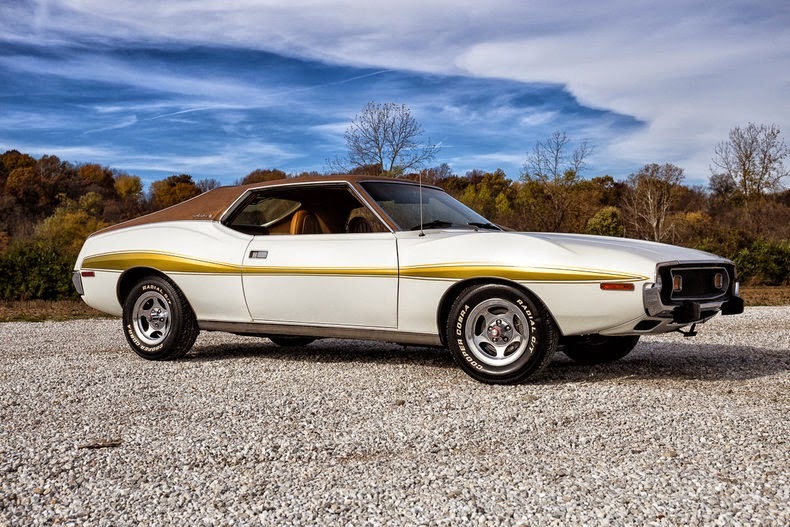 Find this 1973 AMC Javelin here on eBay currently bidding for $15,100 reserve-not-met with a few hours to go, located in St Charles, MO. 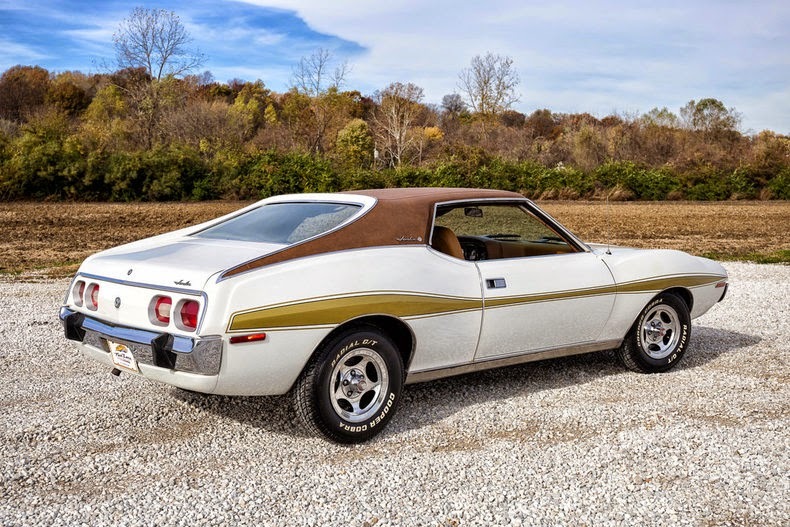 One look at this car might bring flashbacks of war in Southeast Asia or the oil crisis, but put those negative thoughts aside and feast your eyes on a white car with brown boot style vinyl top and gold accent stripes. Raised white letter radials and the beginnings of rubber impact bumpers...oh yeah. Is the dash surround paisley? It might not be paisley, but it is a swirly pattern in mustard surrounded by a sea of brown. 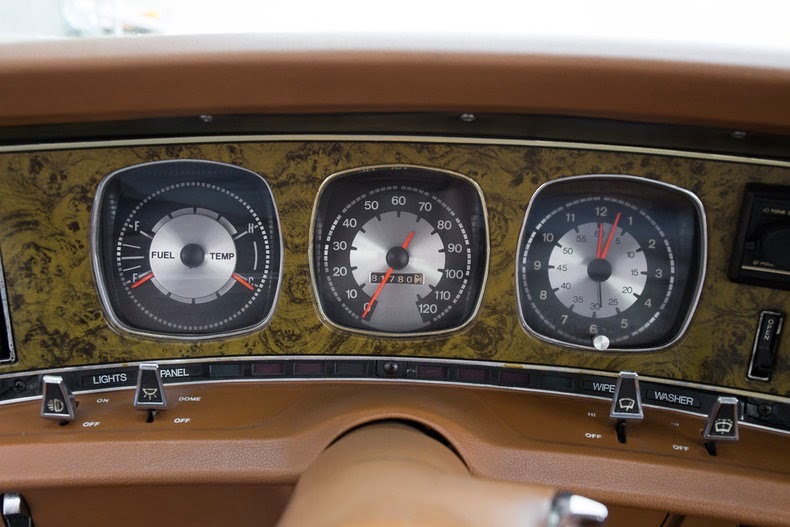 The gauges, however, are exactly what you would expect from the 70s -- in fact, I'm pretty sure I had a clock many years ago that matched these gauges -- colors, font and everything. 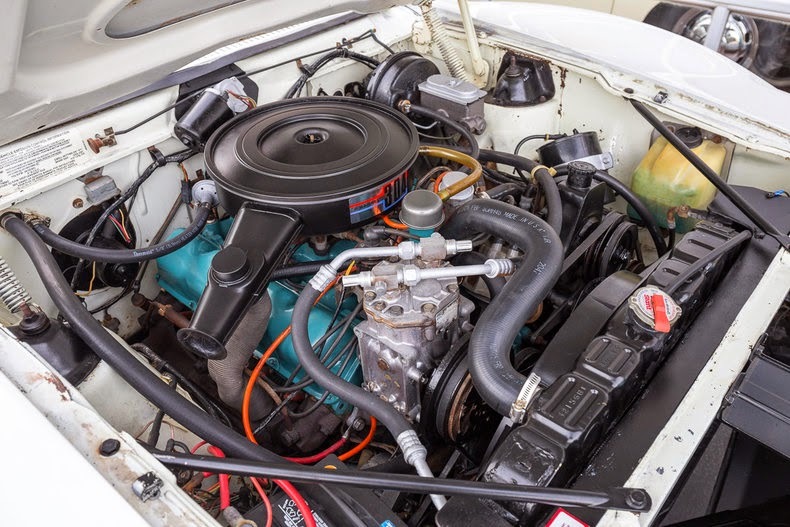 The 70s theme continues under the hood where a decent sized AMC 304 V8 pushes out mediocre horsepower figures due to smog controls. The rating of 150 horsepower sounds low and it is...there is no amount of Pink Floyd blasting from your tape deck will make up for the lack of forward motivation. Maybe a giant winged hood decal...nah...that is another car. Really takes you back! What great 70's colors. The current bid is looney tune though, for $15k you can get a restored 69 AMX or 70 Mark Donahue. this may be excellent, but does it have color-matched(ish) brown hubcaps like this one? The prettiest of the late ponycars, like all AMC product of the day the material quality was crap but then so were most of the others.